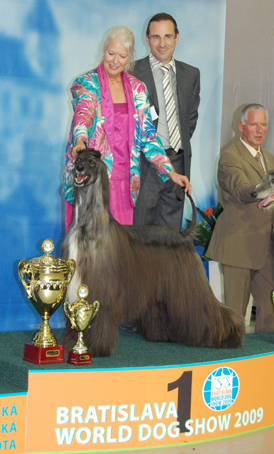 Since 1976 we breed Afghan hounds based on topwinning Australian & American lines. Top Breeder 1999 in Sweden. Top Afghan 1988, 1994, 2000 and 2009. Numerous champions, the most known World Champion Multi SBIS/BIS Kingsleah Blue Star "Svinto". Some years later, in 2009 and 2011 "Kid Sox" Star´T Cutting Trax of Jhanzi wins the World Champion title twice, in the same grand style as his granddad Svinto. See photo below. Our policy is to give you the opportunity to get the best from us! All the excellent results from our upcoming stars around the world give the tempo at Kingsleah. Thank you everyone for the love and care of our dogs! Without you it would not have been possible. We have always been willing to sell our most promising puppies to serious show homes. Welcome to Kingsleah! Hope you will enjoy the stay!